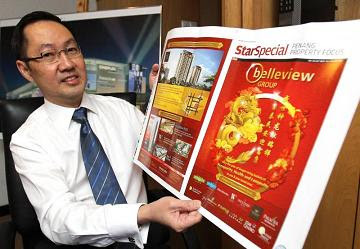 The Belleview Group is undertaking the development of RM1.724bil worth of property this year for Penang island and Kedah. Its managing director Datuk Sonny Ho said some RM360mil worth of property projects including All Seasons Park’s final phase, Moulmein Rise and W Residence were planned for the island. “The remaining RM1.364bil worth of property included the third and fourth phases of the Kulim-Techno City (KTC) project, Amansuri Residences, Aman Central and Star Centro in Kedah. “Kicking off the launch for Penang island in April is the RM200mil Moulmein Rise project in Pulau Tikus, Penang, a 27-storey iconic structure comprising 84 life-style suites and a two-level podium of retail shoplots, with views of the sea-fronting Gurney Drive,” he said. Designed architecturally to be a modern building, it would include a host of desirable amenities with five-star features and state-of-art security system, he added. In May, Belleview will launch the RM100mil Autumn Tower comprising 220 condominium units for the All Seasons Park project in Bandar Baru Air Itam (popularly known as Farlim), Penang. The built-up area for the units ranges between 850sq ft and 1,323sq ft. The project also features a full range of modern recreational facilities. Ho said the sales of the Summer, Spring and Winter Towers had been a roaring success, with only a handful of units available. “The third project launching on the island in June is the RM60mil W Residence on Jalan Utama. “W Residence comprises eight freehold bungalows with a gated community that provides a safe and secure environment, monitored by closed circuit television cameras and protected by a two-tiered security electronic card system,” he said. For Kedah, Belleview kicked off with the launch of the RM180mil Amansuri Residences in Alor Setar on Tuesday. The Amansuri Residences, Ho said, comprised 277 condominiums with built-up areas of 1,248sq ft onwards. “Equipped with an advanced three-tiered security system, the project has extensive water features, landscaped greenery and a grand guest drop-off atrium,” he said. Belleview will then launch the RM34mil third and fourth phases of the KTC project at the Kulim Hi-Tech Park in the second half of this year. Ho said both phases comprised 1 1/2 storey and double storey terraced houses, single-storey and 1 1/2 storey semi-detached houses, and single storey bungalows. “The KTC project is about 20 minutes away from the Penang Bridge, and is a self-contained township with schools, hospitals, a hypermarket, a recreational park, a golf course and multi-national factories nearby,” he said. In June, Belleview will launch the RM150mil Star Centro in Alor Setar, a multi-functional commercial centre with 32 units of three-level shop offices and a leading hypermarket as the anchor tenant. The project is located at the intersection of Jalan Tambang and Jalan Gangsa near the edge of the city on the west side which is accessible from all directions. Ho said the project would offer a vibrant retail mix of restaurants, lifestyle cafes, banks, telecommunication centres, pharmacy, and personal care outlets. Belleview Group recently started the construction of the RM1bil Aman Central, the largest shopping mall in Kedah. The project, located along the busy Lebuhraya Darulaman, will have six floors of retail outlets, providing food and beverage services, entertainment, fitness centre, and bowling alley. All the projects, he added, had received overwhelming response and enquiries. Meanwhile, Henry Butcher Malaysia (Penang) director Dr Teoh Poh Huat said the sentiments in the property market would remain cautiously optimistic. “However, there are still a strong propensity to buy in preferred locations and an interest in well conceptualised schemes with good quality finishes and security.